The de Havilland DH 112 Venom was developed from the de Havilland Vampire which it was built to replace, the DH 112 Venom prototype first flew in September 1949, it featured thinner wings and a more powerful engine than the Vampire, this resulted in improved speed and altitude performance. The Venom fighter-bomber proved to be highly successful and over 375 were built of the first variant, many of these were for export to numerous foreign military powers. The de Havilland Venom was used operationally by the RAF from 1948 seeing action in the the 1956 Suez Crisis and the Malayan Emergency from 1950 to 1960. In 1962 the last de Havilland Venom was retired from RAF frontline service, newer designs like the Gloster Javelin and Hawker Hunter being it's effective replacement. It is of note that 100 Venom Mk-4 fighter bombers were produced under licence in Switzerland using a consortium of numerous companies for the Swiss Air Force, the Swiss Air-Force continued to operate their de Havilland Venom FB Mk-4 fighter bombers, like the one pictured below having it's engine changed, until 1983. This de Havilland Venom, wr470, is currently operated by Aviation Heritage Ltd, it has been painted to represent a RAF No.208 Squadron aircraft in Middle East service during 1958. The aircraft is in fact J-1542, a Pilatus licence built aircraft which served with the Swiss Air Force from 1954 until May 1984, initially as a high altitude photo reconnaissance platform, and later as a trainer. It is worth noting that this Venom still retains the now rare cartridge starting system. This picture of a de Havilland Venom has been digitally re-mastered from a picture kindly placed in the public domain by Sandstein. We only authorise non-commercial use of our copyrighted contents and particularly encourage it's use for educational purposes. 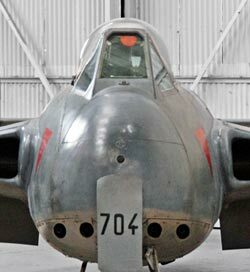 3) Use of this de Havilland Venom information, or any of our pictures on websites re-distributing copyright free material is strictly prohibited.